Like hot oil on a stripper pole, like KY Jelly on a wiffle ball bat, like that mystery residue inside your leather hot pants, Chow Nasty is the musical lube that keeps San Francisco slippery. For years the electro-sexual trio has riled up the clubs, galleries, warehouses, and garages across the city, honing their punk-funk party rock to dangerously debauched levels. 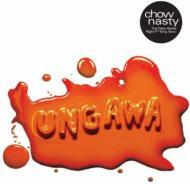 Finally, Chow Nasty delivers their first-ever recording, UNGAWA.. THE PARTY STARTS RIGHT F*#kING NOW.